Rachel Bilson and Hayden Christensen will be receiving this amazing gift from Hollywood Baskets. If they acknowledge their gift Hollywood Swag Bag partnered with Whole Foods and will GIVE BACK and pay it forward to a deserving mother at LA Family Services!! Thank you to all of the amazing brands that took part! 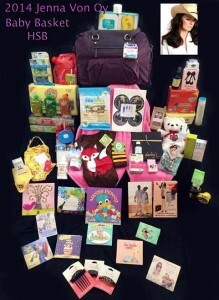 Jenna Von Oy and her baby will be receiving this amazing gift from Hollywood Baskets. 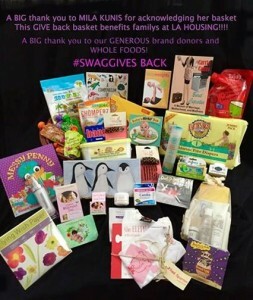 If she acknowledges her gift Hollywood Swag Bag partnered with Whole Foods and will GIVE BACK and pay it forward to a deserving mother at LA Family Services!! Thank you to all of the amazing brands that took part! Mila Kunis helps to #GIVEBACK to deserving mothers in Los Angeles. #WeGiveLocal Thank you #WholeFoods and all of the amazing brands who support our cause!! Mila Kunis sent us this photo with a big THANK YOU on the envelope for her baby basket! We thank #MilaKunis for paying it forward and NOW we offer a GIVE Back Basket to a deserving Mom at #LAhousing this week! Stay tuned! !